For 31 years, the Guerrilla Girls?have harassed, shamed and humiliated the mainstream world of art for failing to include women and artists of color in their galleries. Since 1985, the radical feminist art activists have used billboards, sticker canvassing campaigns, t-shirts, art installations, books and speaking engagements to slap art institutions in the face with facts on how they perpetuate racism and sexism. “We did it because we were pissed off,” one of the group’s?founding members, who goes by the name Frida Kahlo, told an audience at the Arts Exchange?in White Plains?on Monday. The?anonymous gorilla mask-wearing activists, who take on the?names?dead female artists, are still pissed off. And they will continue to be until museums root out the corruption that prevents women and people of non-white?racial and ethnic backgrounds from having their work shown. “In the U.S. most museums are funded and overseen by wealthy art collectors,” said Kahlo, reading from The Guerrilla Girls Art Museum Activity Book. “The 1 percent of the 1 percent. 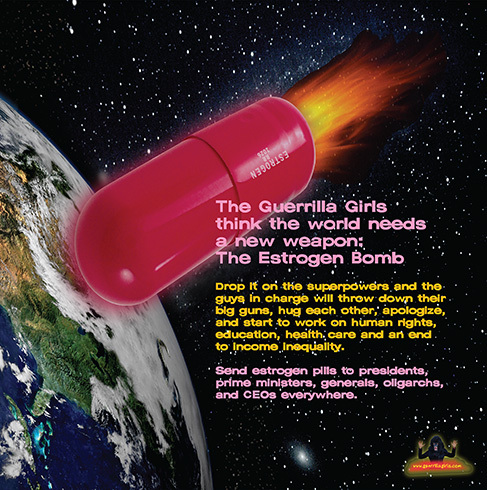 The Guerrilla Girls, known as the “conscience of the art world,” have been all over the planet?protesting discrimination with humor and statistics that?win over?hearts and minds. ?Their appearance in Westchester was a part of ArtWestchester’s Spring exhibit, SHE: Deconstruction the Female Identity.? Frida Kahlo referring to a 2003 piece by the Guerrilla Girls that was erected in Hollywood. 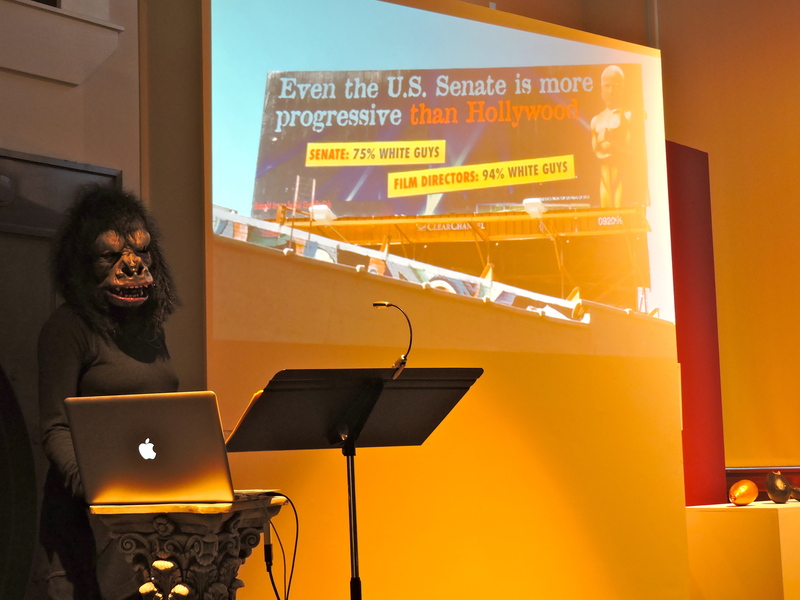 The?Guerrilla Girls acknowledge?that there hasn’t been major?changes?in the statistics that highlight racism and sexism throughout the art world. Their work, however, has made a difference and has woken people up to the fact that this discrimination exists. The?Guerrilla Girls’?art now appears in the very galleries that they’ve protested. ?The Whitney Museum of American Art bought the Guerrilla Girls’ entire collection from 1985 to 2012 in 2014, which criticized The Whitney itself for failing to have female solo shows. “It’s kind of a thrill to criticize institutions on their own walls,” Agha said. The masked do-gooders encouraged the audience to turn the art world and other places where discriminations?exists, on its head. They credited movements, like Black Lives Matters, for their efforts?in fighting for a more just world. The Guerrilla Girls also want artists to know that if they’re not being accepted in the world of mainstream art, they aren’t failures. The system isn’t set up for them to be apart of it. Instead, the Guerrilla Girls encouraged artists to pursue opportunities?that fulfill?them creatively rather than those that offer notoriety.